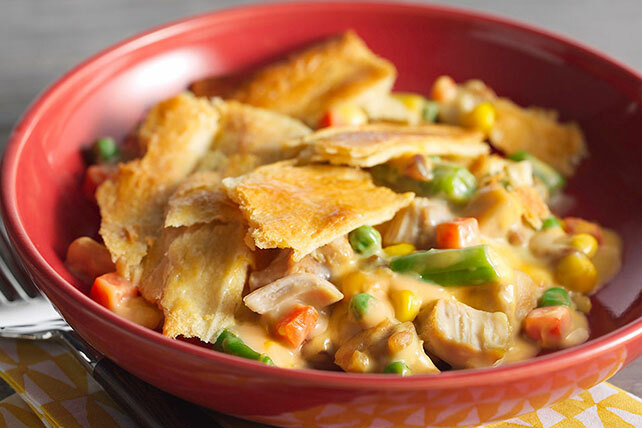 Use our Easy Pot Pie Recipe for a cheesy chicken dish in under an hour! Frozen veggies and pre-made dinner rolls help make our Easy Pot Pie Recipe so easy. Cook and stir chicken in large skillet sprayed with cooking spray on medium heat 8 to 10 min. or until done. Stir in vegetables and soup. Spoon into 9-inch square baking dish sprayed with cooking spray; top with VELVEETA. Unroll dough into 4 rectangles; firmly press seams and perforations together to seal. Place over chicken mixture; press ends of dough to top edge of dish with fork to seal. Bake 20 min. or until crust is deep golden brown. Substitute 3 cups shredded rotisserie chicken for the cooked cut-up fresh chicken.